Music in the Park Concert Series – Sunday, Aug 21 at Rotary Park located at 400 NW Vesper. This free concert series features a different band every Sunday night. This week Lipriddle (classic rock/alternative) takes the stage at 6:30 - 8:30 p.m. Bring lawn chairs, food/drink or concessions available. To see the complete 2011 concert lineup, see the attached flier. Centennial Pool-Plex – Open 12:30-7 p.m. daily. The pool, located at 2401 NW Ashton Drive, features a zero depth wading pool w/water features and two giant waterslides. Admission $5. Adult Aqua-Aerobics class at 11 a.m., cost is $4. Adams Pointe Golf Club – 1601 NE RD Mize Road. 18-hole championship course and a practice facility. Call 816-220-3673 for daily fees and a Tee Time. We’re opening the Centennial Pool-Plex for dogs! the fenced area of the pool, leashes are required on all dogs. To register in advance or for additional information, contact the Blue Springs Parks & Recreation Department at (816) 228-0137. Walk-in registration will be accepted up to a maximum capacity of 100 dogs. Blue Springs, Mo. – Blue Springs Parks & Recreation Department will hold a series of three public hearings in regard to future plans for bike and trail routes within the City. The City recently completed construction and opened phase I of its bike and trail system over a year ago. The current planning process is designed to gather public opinion about facilities constructed in phase I and to solicit input for the next phase of development. The open house format and information will be identical at each hearing so if residents cannot attend the hearing in their district they are encouraged to attend one of the other hearings. Participants will have the opportunity to review the current bike route and trail locations, chart on maps where they would like to see future improvements, and complete a short survey to help determine their personal or family use/interest, and priorities for the next phase. We encourage the public to attend, everyone from serious or recreational cyclists to novice trail users are welcome. Information gathered at these public hearings will be used in the future to develop and project budgets for additional phases of construction. Vesper Hall Ice Cream Social (50-Plus) – Friday, July 8, 6:30 – 8:30 p.m. Vesper Hall, 400 NW Vesper Street. Enjoy ice cream, cakes & pies with live musical entertainment. 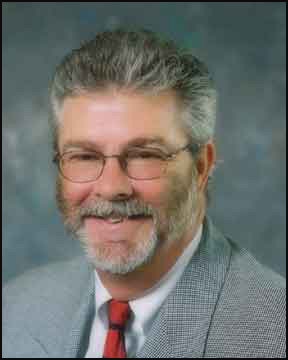 Donations accepted for Vesper Hall Site Council. Blue Springs Let’s Move! Citizen Summit – Saturday, July 9, 8:30 a.m. – 12:30 p.m. Blue Spring School District Freshman Center, 2103 NW Vesper Street. Join the Blue Springs initiative & help us build generations of healthy citizens. 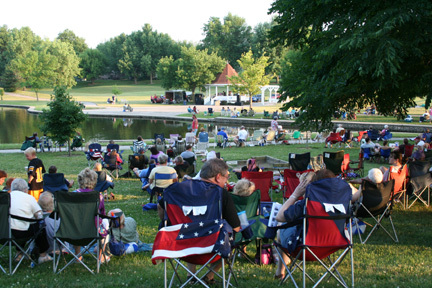 Music in the Park Concert Series – Sunday, July 10 at Rotary Park located at 400 NW Vesper. This free concert series features a different band every Sunday night. This week the Vantage Point (Top 40) takes the stage at 6:30 - 8:30 p.m. Bring lawn chairs, food/drink or concessions available. Centennial Pool-Plex – Open 12:30-7 p.m. daily. The pool, located at 2401 NW Ashton Drive, features a zero depth wading pool w/water features and two giant waterslides. Both daily admission fee and summer membership passes are available. Blue Springs, Mo. – The Blue Springs Parks & Recreation Department will host a ribbon cutting and dedication ceremony on Saturday, June 4 for the new trail located in Ward Park, 1000 SW 22nd Street. The ceremony begins at 11 a.m. and will be held at the south entrance to the park in the 22nd Street parking lot. Immediately after the ceremony will be an informal community walk to help dedicate the new trail. Residents are encouraged to lace up their walking shoes or bring their bikes to help Blue Springs Parks & Recreation kick-off National Trails Day 2011 on June 4. National Trails Day 2011 focuses on bringing together outdoor enthusiasts of all kinds to celebrate the natural heritage of the United States trail system. Traditionally held each year on the first Saturday in June, National Trails Day was established to recognize the value of recreational trails and the people involved in building and maintaining them. For more information on National Trails Day 2011, visit www.marc.org. The land for Ward Park was donated to the City by George Ward in the late 1970’s. The original construction of the park was in 1980, which included the original trail. The Parks & Recreation Department secured a Federal ARRA grant to help fund the replacement and upgrade of the over thirty-year-old trail. The new trail is 8-feet-wide, twice the width of the old trail, and includes two new bridges and improvements to the existing bridges. The new trail also connects to Quarry Road on the west end of the park which is a part of the City’s bike route and trail system. In the case of inclement weather, this event will be canceled and will not be rescheduled. For more information on this trail, contact Roscoe Righter, Director of Parks and Recreation at (816) 228-0137 or email to rrighter@bluespringsgov.com. For more information about Blue Springs bike routes and trail systems, visit www.bluespringgov.com/parks. On Saturday, May 28 from 12:30-7 p.m. we invite you to join us at the kick-off event for the Centennial Pool-Plex! The pool, located at 2401 NW Ashton Drive, will be free to the public for this one-day event. The pool will be open 12:30 – 7 p.m. Sunday and Monday as well. Both daily admission and membership passes are available. 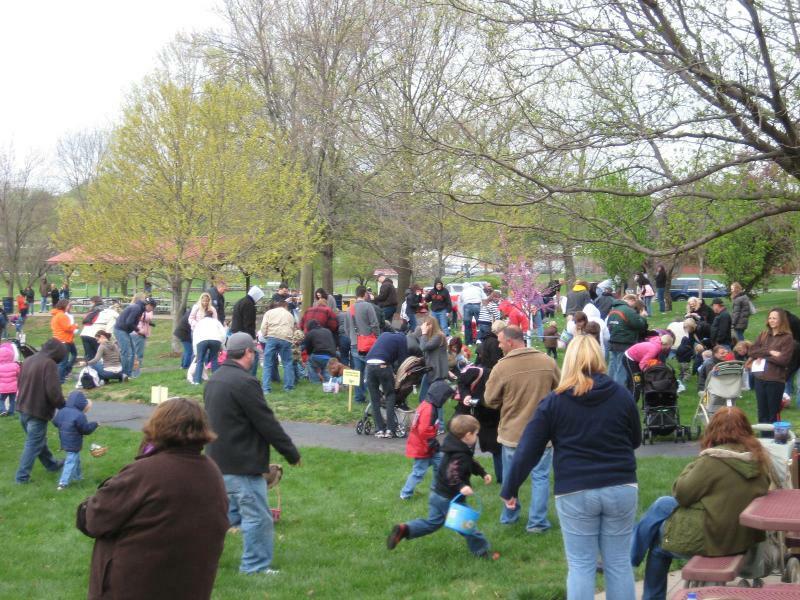 On Sunday, May 29, the Music in the Park Concert Series returns to Rotary Park located at 400 NW Vesper! This free event concert series features a different band every Sunday night from 6:30-8:30 p.m. The Krazy Kats will kick-off the 2011 season. To see the complete 2011 concert lineup, open attached. Centennial Pool-Plex opens May 28th. Bring your family and enjoy a free day of fun. Summer is finally here. We are excited about bringing you a variety of fun and challenging leisure time opportunities. Have a great summer at the park! Now that our weather is at least bouncing between spring and summer, activity at Grounds Park is picking up. I thought our public might be interested in some general information related to the "O". You may be wondering what I am referring to as the "O". Well the official name of the park is Gregory O. Grounds Park. We have started referring to the park as the "O", it is shorter and a catchy reference. It's like; I will meet you under the "Clock", which most Kansas Citizens know is Union Station. Or the "K" is short for Kauffman Stadium. So if you hear someone refer to the "O" in Blue Springs, think of Grounds Park. The park is 106 acres total with 54 surface acres of water named "Lake Remembrance", surrounded by 52 acres of park land. It has been open for about four years, with fishing and the trail opening more recently. The oldest feature is the Dog Park facility. Thirty acres of the 52 acres of land were donated to the City for park purposes. It's time to purchase your summer swimming season and save some money. Purchase your Centennial Pool-Plex preseason pass now through Memorial Day and you can save 5%. In addition to these savings you will also receive FREE GUEST PASSES for each pass purchased before Memorial Day. Receive 2 FREE single day guest passes with the purchase of a Season Family Pass and 1 FREE single day guest pass with the purchase of a Season Individual Pass. These are good anytime during the 2011 summer swim season. *Maximum of two (2) adults per family pass, 21 years of age or older. Additional household adults will be required to purchase an Individual season pass. Additional family members over four (4) will be charged $15.00 for Residents and $16.00 for Non-residents. FREE DAY AT THE POOL: Come and check out what Centennial Pool-Plex has to offer by attending our annual FREE DAY AT THE POOL on Saturday, May 28th. 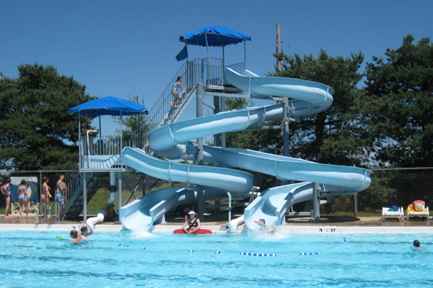 Bring the whole family for a free day of fun at Centennial Pool-Plex. 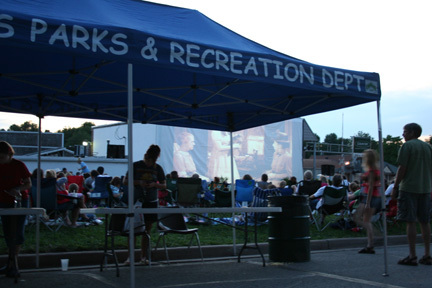 Come out and enjoy a free movie in Downtown Blue Springs on Friday, June 24th! Bring your family and friends to the Blue Springs Street Flicks located between 12th and Main. It will be an enjoyable night with a little something for everyone! Co-sponsored with the Main Center Merchants and the Blue Springs Parks & Recreation Department, we are excited to present the movie The Karate Kid. Activities for children will begin at 7:15 PM and the movie begins at dusk. Bring your lawn chairs and blankets, and get comfortable for a great relaxing evening. Make plans for our upcoming free downtown Street Flick: How to Train Your Dragon - July 22nd. The cost is only $10.00 per participant. Prizes will be awarded, which will consist of skate boards, wheels, bearings, beanies and skate clothing. There also will be a product toss at the end of the event. Skaters will be judged on time runs and best trick. There will be only 20 spots available at each level. During the event, helmets will be required along with signed waivers. This event continues to do well, especially with the help or our sponsors, Elks 2509 of Blue Springs. During the event, there will be music and concessions. 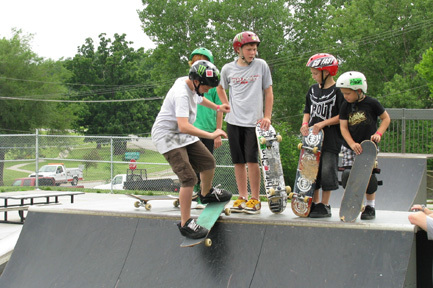 I encourage people of Blue Springs to stop by and watch the excitement and see the skaters perform their different tricks. Pre-registrations are recommended. Contact the Parks & Recreation Office, 228-0137. Experience a truly unique group night bike ride through the streets of Blue Springs on Saturday, June 11th with a rain date of Saturday, June 18th. Experienced cyclists of all ages are welcome and may choose between a 14 mile or 19 mile route. Both will start at 11:30 pm at the Centennial Pool-Plex, 2401 NW Ashton Drive. This is not a timed event so ride at your own pace. Journey through downtown Blue Springs, the historic district, and out to Adams Dairy Parkway. The roads will be marked and police officials will monitor the busy intersections with volunteers at most of the turn points. Pre-registration ends June 1, 2011; the cost is $20 per cyclist. Registration after June 1 will cost $25 and does not guarantee a T-shirt. Contact the Parks & Recreation Department or The Bike Stop Bicycle Store for an entry form. Front lights, tail lights, and helmets are required. Music, snacks and beverages as well as prizes donated by area merchants await registered participants at the end of the route. Proceeds benefit bike trails in Blue Springs. Preregister with Parks & Recreation, by phone with Visa, Discover, or Master Card, on line at www.bluespringsgov.com, by mail or in person at City Hall, 903 W. Main Street. Office hours are Monday through Friday, 8:00 a.m. to 5:00 p.m. For additional information call the Parks & Recreation office at 228-0137. Our 15 week long free park concert series starts Memorial Weekend May 29th. These Sunday evening concerts are held at Rotary Park from 6:30 to 8:30 pm. Bring your chairs and blankets and enjoy some quality music in a great setting. Music in the Park sponsors include: 1st MidAmerica Credit Union, MDonalds of Blue Springs, McCarthy Blue Springs Nissan, Blue Springs & Lake Lotawana Optimists and The Examiner Newspaper. EAT LOCALLY - It's true, you don't have a lot of time to grocery shop and the food you buy needs to provide the biggest nutritional bang for your buck. Eating locally and seasonally is the best way to ensure you are cooking with nutrient-dense ingredients. Foods that are imported from other countries or trucked in from across the nation lose their vitamins and minerals along the way. Visiting your local farmers market or co-op will not only improve your diet, it will also leave a smaller carbon footprint on the environment. To further support your farming community and feed your family well, buy grass-fed meats and poultry from local farming families. "Play for grown people is recreation-the renewal of life; for children it is growth-the gaining of life."